Ordinary stars emit X-rays. Our closest star is, of course, the sun. XMM will not be observing the sun, since it is too close and bright for the detectors to cope with. The very sensitive instruments on XMM will be able to study the X-ray emission from much more distant stars. However, astronomers have already learned a lot about the ways in which stars can radiate X-rays as a result of studies of our sun by special solar X-ray satellites. This X-ray image of our sun, taken by the Japanese Yohkoh satellite, shows that the sun looks very different in X-rays to its familiar appearance in normal light. 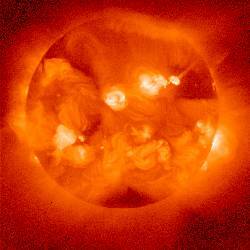 The surface of our sun (known as the "photosphere") has a temperature of about 6000 oC, which is much too low to emit X-rays. However, above this "cool" surface lies the solar corona, where the temperature rises to millions of degrees, as a result of heating by shock waves and magnetic fields emanating from the solar interior. This hot gas is much brighter in the vicinity of "active regions" where solar flares occur, and so these show up very clearly in the X-ray image. The effect of magnetic fields, which channel the ionised gas, can also be clearly seen in the morphology of the X-ray emission. 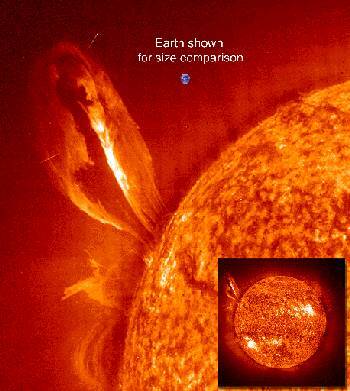 Large flares on the surface of the sun can send huge plumes of hot gas, much larger than the Earth streaming out into space, and X-rays are generated when fast moving particles collide. Our sun is a fairly weak source of X-ray compared to some other stars. This is fortunate for us, since high energy radiation (UV and X-radiation) are harmful to living cells. In practice the Earth's atmosphere shields us from the great majority of this radiation from the sun, although it is still possible to get unpleasant "sunburn" on a clear day. When sensitive X-ray telescopes like XMM are pointed at clusters of stars, such as those in the Orion Nebula, where stars are currently being formed, many bright X-ray point sources are seen. An X-ray image of a part of the Orion Nebula about 10 light years across, taken with the US Chandra X-ray satellite. At a distance of 1800 light years, this is the closest large star-forming region to the Earth. Most of the X-ray sources in this image are normal stars in the nebula. Some of these stars have an X-ray power hundreds of times greater than our sun. In some very massive blue stars, these X-ray are believed to be generated by shock waves in the fast wind of gas driven-off from the surface of such bright stars. However, some X-ray bright stars are small red stars, which are quite dim in the optical band. 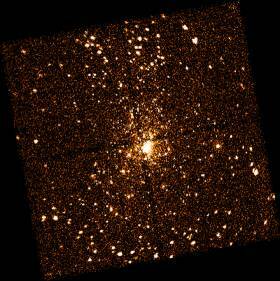 For example, this XMM image of a group of nearby stars shows the bright star Castor, in the constellation of Gemini. 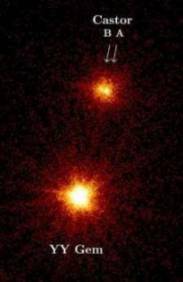 This is a very bright star, which isactually a very complex system of six binary stars, two of which can just be distinguished in the X-ray image.To the south of Castor is the red star YY Gem, which is much fainter, and has a surface temperature of only 3000degC, yet is a much brighter X-ray source. This star shows huge flares, much larger than those seen in our sun, and this is the origin of the bright X-ray emission. The following animation, shows that such active flaring behaviour is common amongst X-ray bright stars. The Chandra image below shows how the X-ray power of cluster of young stars in the constellation of Ophiuchus varied over a period of a few days during a long observation by the satellite. Animation showing rapid variations in the X-ray flux from young stars in a cluster in Ophiuchus.